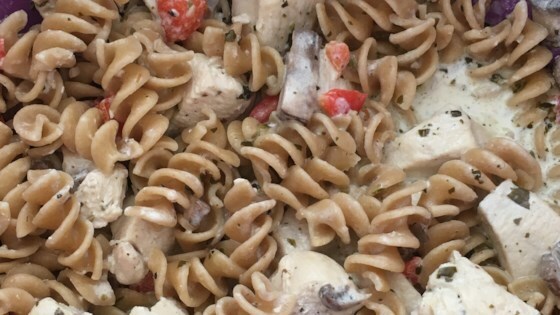 "This creamy combination of two fave pasta sauces uses shortcuts (like cream cheese spread and purchased pesto sauce)-a clever way to serve an impressive dish in no time!" Substitute: Substitute 1-1/2 cups roasted red pepper strips for the fresh red pepper strips. Special Extra: For more intense flavor, stir in 1 Tbsp. lemon zest or 1/2 cup pitted dry-cured olives, along with the peppers, Parmesan and pesto. Food Facts: Pesto is an uncooked sauce made with fresh basil, garlic, pignoli (pine nuts), Parmesan or Pecorino cheese and olive oil. This classic, fresh-tasting sauce originated in Italy and is a favorite on pasta and chicken dishes. Look for prepared pesto in either the refrigerated aisle of your supermarket, with the sauces and dressings in the produce aisle or with the jarred pasta sauces in the grocery aisle. The sauce was watery, The cream cheese didn't melt so much as separate and the flavor was bland. I followed the recipe exactly. Great recipe! Added salt, pepper and garlic powder to the chicken. It turned out fantastic! Was very easy and quick to make...had a great flavor, & my family loved it!! Only difference was I added about a tsp of garlic powder to the sauce & I served it over penne pasta. Good, but as written doesn't work. Needs corn starch to thicken, garlic to add flavor, and 1 T more pesto. I had to make these adjustments, and with such it is really good.